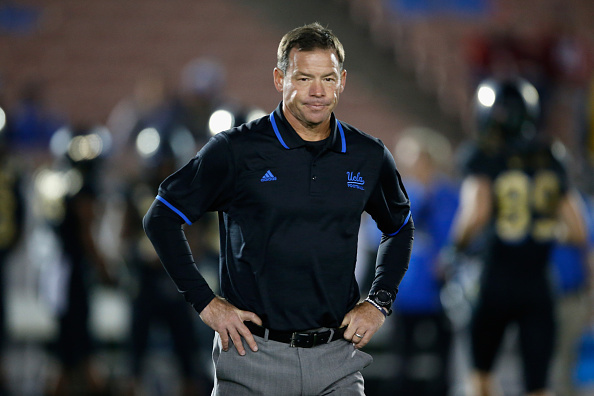 Did UCLA make a mistake in firing Jim Mora? Mora brought success his predecessors couldn't, but that wasn't enough to save his job. There were no leaks, rumors, or weeks-long message board wrangling over the subject. Shortly after 2 p.m. ET on Sunday, the UCLA football Twitter account sent out a post noting that Jim Mora was no longer the head football coach, and that was that. Mora’s firing came a day after UCLA lost to rival USC 28-23 Saturday night, highlighted by some of the best special teams trickeration you will see all season. This will be spun several different ways, mostly that Mora (41-24 at UCLA) was never able to take the program to expected heights despite having what looked like a surefire star quarterback in Josh Rosen and that UCLA made this move now because it gave the Bruins extra time to go big-game hunting on available coaches like Chip Kelly. The truth is, both of those are likely true. What probably will not get much publicity is how Mora genuinely moved UCLA forward before getting the van stuck in mud like in that new Volkswagen commercial that gets overplayed seemingly every televised football game. Everyone has a tendency to immediately move forward with coach firings, even though one guy losing his job means a savage trickle-down effect to more than just the guy in all the headlines and his family. But Mora was an important part of what UCLA football will become after him, not unlike a President’s policies not being fully felt until after his term has ended. When Mora signed on with UCLA, the Bruins had only once eclipsed eight wins in their previous 13 seasons. In eight of those seasons, they had been .500 or worse. Mora’s upward movement for the program was immediate, as he went 29-11 his first three seasons, offering genuine hope of a return to the recent halcyon days of Cade McNown and UCLA being a national player. It would end up not coming to pass, obviously, even though Mora’s time in L.A. was drastically more successful than that of his predecessor. Thus is the harsh landscape of college football. On the surface, it seems highly idiotic to fire a coach who won you at least eight games four times in a six-year tenure and at least 10 twice. Logic suggests that unless you have someone banging down the door that is a iron-clad lock improvement, you are just sending out the message that your school is a darn near impossible place to coach long term. That unfortunately is where we are at. More than any point in history, pressure is on college coaches to be successful all of the time or risk seeing any accomplishments be overridden in one bad year. There are always big-game coaches that are either potential realities or pipe dreams for schools to chase that make it enticing enough to gamble on dumping a successful head coach who hit a rough season. It’s not fair, but lack of job security is the tradeoff for these coaches’ handsome salaries. Whether or not UCLA made a grave mistake, we will find out in due time. College football coaches should be continually on notice that they are one year away, and unless UCLA entices a big name like a Chip Kelly or such, this possibly could be a big ole mistake.